Being aware of bicycle safety tips and following the rules of the road helps keep you safe to enjoy years of cycling fun. In most places, bicycles are considered a type of vehicle and the bicycle riders are responsible for knowing and obeying the rules of the road. Bicyclists should always be prepared and aware of other vehicles in their surrounding area. The following are additional safety tips that will help keep you and your loved ones safe and out of harm's way while enjoying time bicycling. Bicycles, like other vehicles, must obey all road signs and traffic signals. Always follow the lane markings on the roadways. For example, If you are in a lane marked turn only do not go straight ahead. Never make a left turn from the right lane of a roadway. Always ride your bicycle on the side of the road with the flow of traffic. Do not pass motorists on the right side. If you are riding in slow-moving traffic, ride in the middle lane. Use hand signals to let motorists know your intentions. Make eye contact with a motorist that you feel may be a dangerous driver. Wear a well fitted bicycle helmet equipped with a chin strap. Choose a helmet with a seal of approval from the Snell Memorial Foundation, the American Standards Institute (ANSI) or the Consumer Product Safety Commission (CPSC). Helmets need to fit snugly without any free movement from side to side. 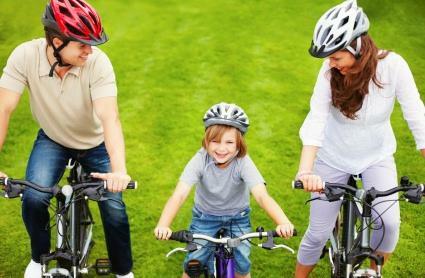 If you are an adult bicyclist riding with a child in a safety seat, the child should also wear a well fitted and approved bicycle helmet. If you are riding a bicycle at night it should be equipped with a white headlight and a rear taillight or rear reflector to ensure that you are visible to motorists. Headlights should be able to be seen at a minimum of 500 feet and taillights at a minimum of 300 feet. Although some riders learn to check the traffic by looking backwards over their shoulder while maintaining their sense of balance and without swerving, installing a rear view mirror on the bicycle is a safer option. Always make sure a bicycle fits the rider comfortably. The bicycle seat should be comfortable to sit on. Many riders choose to wear padded bicycle shorts. Keep bugs and dirt away from your eyes by wearing sports sunglasses. Always maintain bicycles in good working order making sure to check the tires and brakes on a regular basis. Wear clothing that is easy for motorists to see, such as clothing that is brightly colored or is reflective or has reflective areas for nighttime riding. Dress in layers so it is easy to stay comfortable by adding or removing clothing. Never ride a bicycle using headphones for a telephone, iPod or other type of device. Never try to text while you are riding a bicycle. Be aware of hazards in the road such as holes, sewer grates or patches of ice. Watch for other road hazards including sand, wet leaves and gravel. By staying alert while riding and following the rules of the road and other bicycle safety tips, you can increase your safety and cycling fun regardless of your age.